Maryland never seceded from the Union, and therefore was not subject to the Reconstruction policies of either the President or of Congress. This meant that soothing old animosities and healing old wounds, not to mention creating a plan for a world that no longer encompassed slavery, would fall to the state of Maryland and the localities. The war had made the fate of slavery unequivocal, but it had not provided any blueprint for a smooth transition to a new society. It soon became clear that many people who were ready, however reluctantly, to accept the end of slavery were not ready to accept changes to the social structure that slavery had supported. Nor were they ready to welcome back those who had fought against the Union. This was the case along the mid-Maryland border. 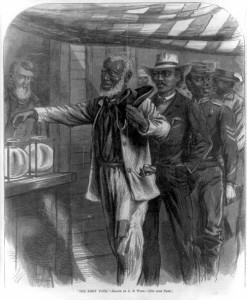 When questions of political and social democracy arose for both former Confederates and newly freed slaves in the region, it was evident that old political, social, and racial divisions had survived the war.